Eye cream is an anti-aging essential. Eye cream is an essential defense against the signs of aging that often appear in the delicate area surrounding the eye. Since the eye area contains no oil glands and the tissue is thin, dryness, fine lines, dark circles, and puffiness often appear. Although one of the first areas to show aging and wrinkles, the right eye care products can help you retain your youthful beauty. Skin Medica TNS Illuminating Cream: This product controls iron-based pigmentation around the eyes. TNS contains peptides that improve the look of your skin. Amazon reviewers mainly gave this product positive reviews. Aveeno Positively Ageless Lifting and Firming Eye Cream: This product is heavily moisturizing, so it's ideal for those with dry skin. Like all Aveeno products, Positively Ageless is hypoallergenic and noncomedogenic. RoC Retinol Correxion: Advertised as a "deep wrinkle cream," Correxion promises to give 10 years back to your skin. With regular use, users should see improvements in 4 to 12 weeks. Websites like MakeupAlley give this product a passing grade. Olay Total Effects Eye Transforming Cream: Effective and affordable, this repairing treatment packs a punch with its potent formula. It's designed to fight dark circles, crow's feet and fine lines. Reviews are readily available on the Olay site. Eye creams are available in hundreds of different formations. Choosing the right one can be overwhelming, but there are some general things to look for. Any cream you choose should provide moisture without weighing skin down -- heavy creams can block the pores around the eye and contribute to puffiness. Dermatologists recommend using creams for the eye that provide both hydration and anti-aging benefits. In addition to moisturizing and anti-aging, consider what conditions are the most problematic for your eyes. Ask yourself the following questions before deciding on a cream. Do your eyes have a tendency towards puffiness? If so, look for creams that contain tightening or depuffing agents, including ingredients such as alpha-hydroxy acids, vitamin C, copper, and retinol. Do you suffer from dark circles or shadows under the eyes? Look for ingredients such as vitamin K, kojic acid, and hydroquinone, which are designed to diminish the appearance of darkness on the skin. Are you looking for a cream to prevent the signs of aging? Moisturizing is key in preventing fine lines around the eyes. Since the skin, particularly around the eye, tends to dry out with age, choosing a preventative cream that provides adequate hydration is important. Are you looking to reduce the appearance of fine lines, wrinkles, or crow's feet? There are many renewing, rejuvenating, and correcting creams available on today's market. Look for formulas containing peptides or antioxidants to help diminish the appearance of wrinkles. Day creams for the eye are typically lighter and often contain ingredients to reduce the appearance of puffiness or bags. Day creams may be less moisturizing, and some even contain a temporary dehydrating agent to tighten the under-eye skin. These also usually include sunscreen with an SPF of 15 or higher to protect the eye skin from the damaging effects of the sun. Night creams for the eye area are richer and more emollient, and are designed to treat and repair more deeply. They may be highly moisturizing, but should not weigh the eye down. Moisturizing eye creams are for general use, and can be applied in the morning, at night, or both. Always read the instructions for use on any cream you're considering. Some creams might include ingredients that should not be worn under exposure to sunlight. Applying eye cream the right way is important since the skin is so fragile. It should always be tapped on, rather than rubbed in. Use the ring finger to avoid excess pressure when applying. The cream should be applied along the orbital, or bone, under the eye. Gently tap a small amount of the product under the eye, moving from the outer edge of the eye inward. There are no "miracle" products, but eye creams can improve the appearance of the skin around the eyes. 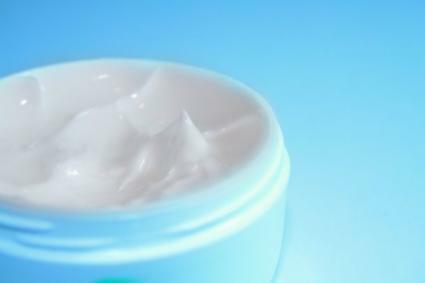 Since the skin is thin and prone to wrinkling, creams that moisturize really can be effective. Combined with ingredients that work to eradicate fine lines and wrinkles, you may notice an improvement with religious use. It's important to stick with a regimen and use eye products consistently. If you experience any discomfort, discontinue use immediately. It often takes a bit of trial and error to find the product best for your skin.